Gone are the times that blogs were predominately reallocated to online diaries where people kept running accounts of their everyday lives. In today’s market, blogs are much more than public journals. In fact small private law practices and large law firms alike use blogs alongside their law firm websites due to the immense value they bring. Sure, it may seem silly for attorneys to be blogging about their niche and what legal services they provide. In fact, blogs provide the ultimate forum to directly communicate with your target audience full of potential new clients. And that’s just the tip of the iceberg. If You Think Blogging is a Waste of Time, Think Again. According to eMarketer, nearly 40% of all US companies use blogs for marketing purposes. HubSpot, a marketing research firm, has found that companies that blog get 55% more web traffic. Out of those companies that blog in the US, 57% have acquired a customer through their company blog. HubSpot has also found that companies with 30 or more landing pages generate 7x more leads than those with fewer than 10. Therefore, assuming you already have a law firm website, you’ll be able to boost your landing page count by adding blog posts. Yes, you can always build additional pages on your law firm website explaining different areas of practice you are also qualified to cover in order to boost your page count. Just be careful to not dilute your law firm’s niche. How much are new clients worth to your practice? Hopefully much more than the cost to create a 300 word article twice a month. So Why Do Law Firm Blogs Attract New Clients? A large part to being found online is ensuring you show up in search engines like Google and Bing. A law firm blog is a goldmine for relevant terms and phrases associated with your brand. You gain more relevance and authority as a firm for your niche with every new blog post. You have the chance to dominate your niche’s keywords for people searching on Google and other search engines. The more value you provide and expertise you demonstrate on your blog, the more credibility you have as an expert in your area of practice. People in need of legal representation trust experts. Your law firm website is an advertisement for your company that runs 365 days of the year. Your law firm blog is no different. Once you create public information on the internet, it will always be there working hard to fight for new business. Blogs provide another avenue to socialize and interact with your customers. For some people it’s more natural and comfortable to contact you via a company owned blog for basic requests and questions than it is to pick up a phone or send an email. Does your law firm have a blog? If so, then you’re already on your way. If not, then Sites For Law Firms can help you get one started. With an assisted setup, our law firm SEO experts will ensure that your company website and new blog is optimized and ready to receive new clients from the web. Contact Sites For Law Firms today and let us help you generate more business. 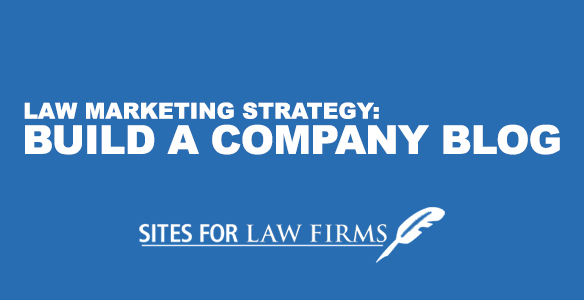 This entry was posted in Law Firm Marketing Best Practices by CEO, Sites For Law Firms. Bookmark the permalink.